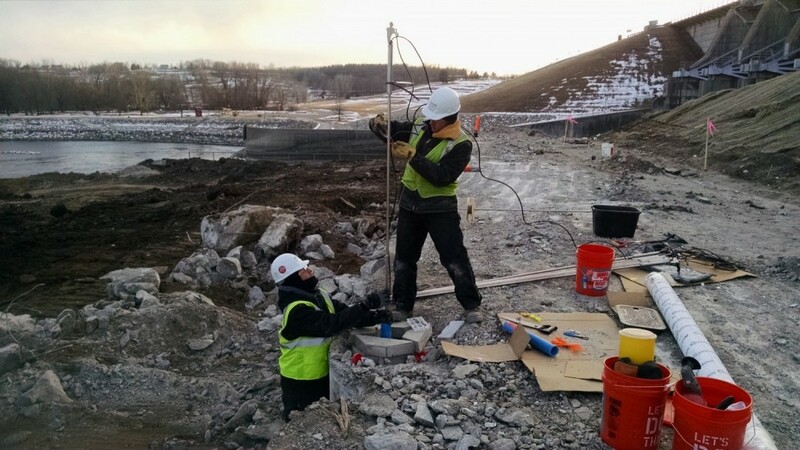 Braun Intertec engineers Robert Lee and Ben Butler stand atop an anchored secant pile wall, as excavation progresses below to permit construction of the powerhouse for the future Red Rock Hydroelectric Dam. In the foreground lies one of the many In-Place Inclinometer arrays Braun Intertec has installed on the project. These particular instruments are installed vertically in specialized casing embedded in the secant wall and extended into bedrock following drilling and coring operations, in order to monitor any horizontal displacement of the excavated wall face. The client is able to view the inclinometer data near real-time on the Braun Intertec website, and is automatically notified of any movements that exceed established thresholds. The Red Rock Hydroelectric Project is located in Marion County, Iowa, at the existing Red Rock Dam, constructed by the United States Army Corps of Engineers (USACE) in 1969, at the intersection of Highway T15 and the Des Moines River, approximately 143 miles above its confluence with the Mississippi River. The Red Rock dam forms a 15,253-acre reservoir, Lake Red Rock, which the USACE operates at a normal conservation pool elevation of 742-feet National Geodetic Vertical Datum of 1929 (NGVD), and can be raised to 780-feet NGVD for flood control purposes. The USACE continues to operate the Red Rock Dam for flood control and recreation purposes, providing a daily discharge based on stream flow and reservoir conditions. 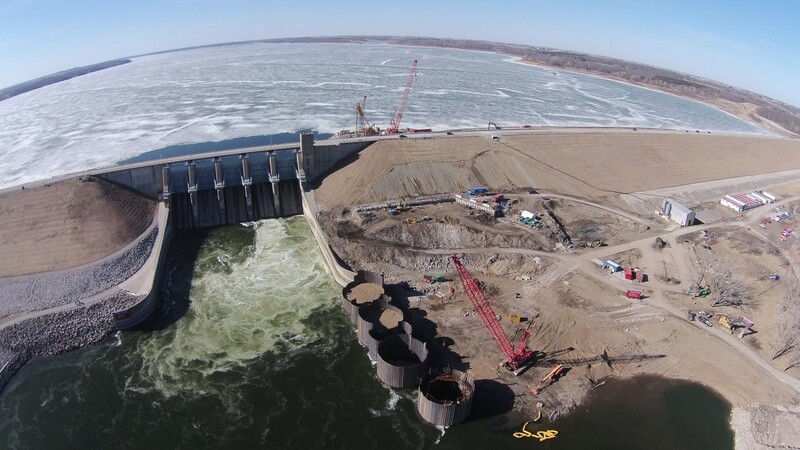 Northeast and adjacent to the Red Rock Dam Spillway is the project consisting of a hydroelectric dam, developed by Western Minnesota Municipal Power Agency, a group of municipally-owned electric services represented by Missouri River Energy Services (MRES). The project has been designed and engineered by MWH Global, and is currently being constructed by Ames Construction. Braun Intertec is providing Ames with a variety of instrumentation and monitoring, drilling, geotechnical engineering, environmental consulting, building sciences, construction materials testing, laboratory testing, non-destructive examination, and field quality control services. The Red Rock Hydroelectric Project will feature a new reinforced concrete powerhouse that houses two vertical Kaplan turbines with a total rated capacity of 36.4 megawatt (MW), located northeast of the existing stilling basin channel. The reinforced concrete intake structure is founded on reinforced concrete shafts socketed into rock and will be 60 feet wide by 112 feet long, and span 96 feet in height. Two 21-foot inside diameter, 275-foot long reinforced circular penstocks connect the intake structure with the powerhouse, requiring penetrations through the existing dam. The intake approach channel will be formed by excavating along the upstream diaphragm wall that will retain the adjoining embankment fill. 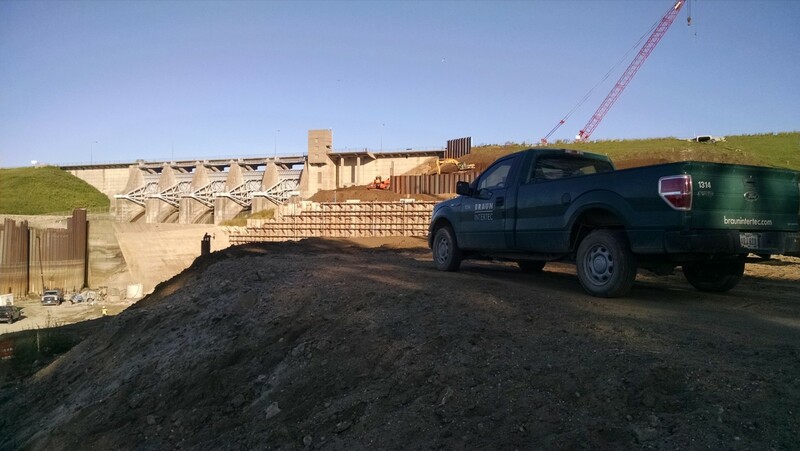 A diaphragm cut-off wall will be constructed to a minimum depth along the crest of the dam, southwest of Highway T15, extending at least 100 feet into the earth embankment from the end of the concrete monoliths. Upstream and downstream cofferdams will be constructed to enable intake, penstock, and powerhouse construction to proceed in the dry. The upstream cofferdam will be comprised of a lightweight concrete platform, and secant pile walls around the intake structure excavation that connect to the new upstream diaphragm wall along the northeast (embankment side) of the intake structure. The downstream cofferdam will consist of a cellular cofferdam and closure dike with the sheet pile cut-off wall to enclose the powerhouse and tailrace excavations from the downstream end of the existing stilling basin wall to the riverbank. With such a large scale of construction, and immense complexity, the Project is required by the Federal Energy Regulatory Commission (FERC) to include instrumentation and monitoring, as with any new hydroelectric dam project.